This is a great project challenge to do after investigation and definition of an inclined plane or ramp. First, have a discussion or read books to have context for their creations. Always review the group-defined rules to encourage positive collaboration. In groups of 2 to 4, each group should come up with a group name. This encourages camaraderie and makes it easier (and more fun) to address the groups. 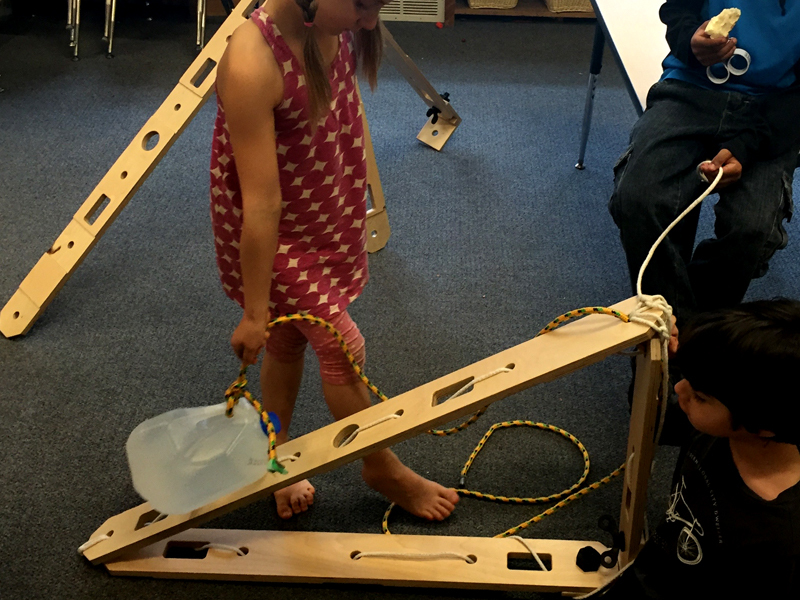 Students will work together to build and use an inclined plane/ramp to move a gallon jug of water from the ground to a pre-determined height. 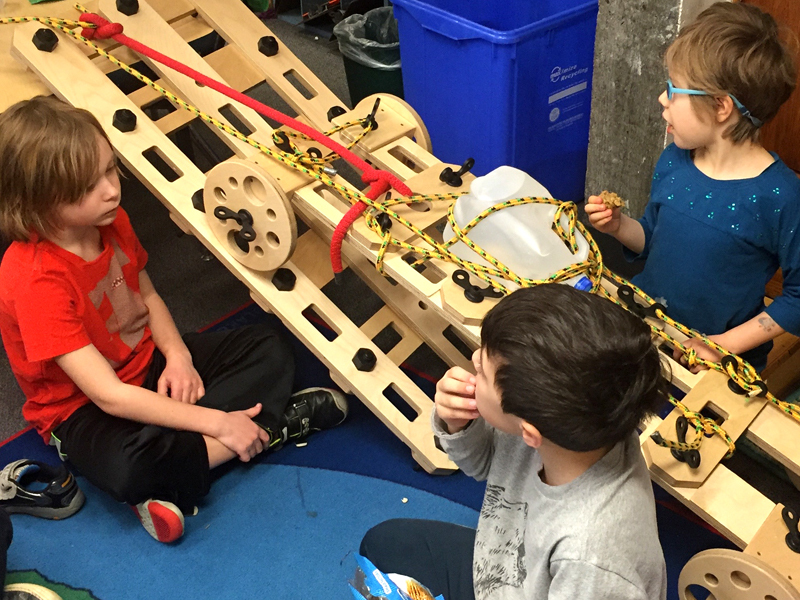 Distribute parts of the Rigamajig kit equally and ask the students to build an inclined plane/ramp to help them move small objects from the floor to a table. They are practicing for the gallon jug. 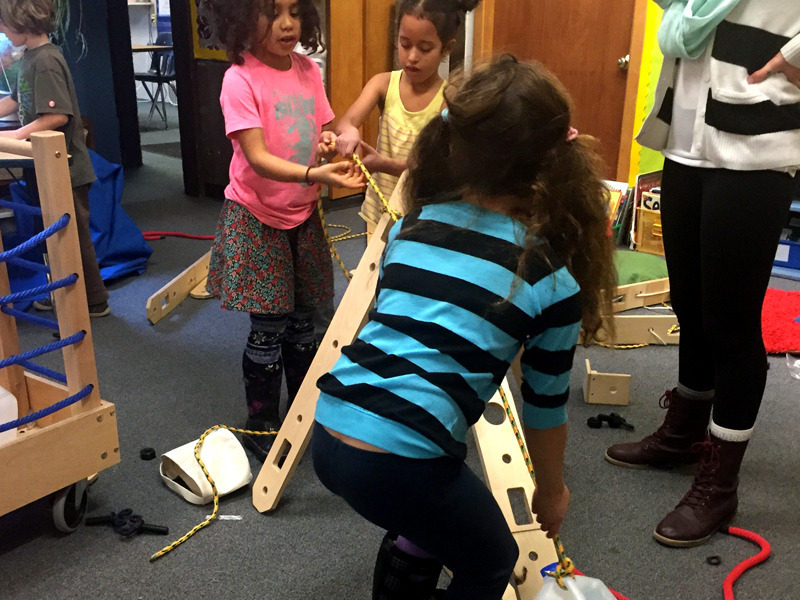 Give time for brainstorming and sharing of building ideas for an inclined plane/ramp. Provide paper and pencils for groups want to draw out their ideas. Once ramps are built, make the lifting of the jugs into an event. Perhaps one group at a time goes, and the other students cheer. Ask students to share about their lifting i.e. was it easy, hard, heavy etc. Teacher will document with pictures and record comments that they notice while building. Here, each group visits each ramp site and is given the space to talk about what they created, how they created it, and what was challenging and easy about building. If it was difficult, what would they do differently in the future? Ask the students to write an individual reflection in a “simple machines journal” that keeps track of their projects. This can be a drawing that is labeled, sentences, photographs; anything that the class/child decides to use as their documentation of their experience and creations. The format should be determined by the person facilitating the explorations. Reflection and keeping a record encourages true scientific behavior and is another skill that emerges from these lessons. Tell us about a problem you encountered and how you and your group members solved it?